Hard Grit has got to be one of the best climbing videos I've seen. My expectations were set quite high because many people had told me this was the vid to get, the bee's knee's, the "essence of the British spirit of climbing" as it states on the cover. And all told, I wasn't disappointed. The movie opens with an eye catching scene. Music stirs and a rhythmic heart beat grows faster as a bold lead takes place, the climber inching ever higher from their last piece, growing more committed. Then there's a pause, the moment of truth in which the imagined becomes reality, and with a gasp the audience watches in horror as the leader plummets downwards, penduluming into a bone crunching arête at great speed. The scene is a primer for the core of the material to follow which focuses mainly on very hard single pitch traditional routes being lead above sometimes dodgy and sparse gear on the gritstone edges of the Pennines. You won't see bolts being clipped. From what I gather bolts are against the ethic of the area. So what we see is mad, death fall potential run outs and even solo's, all in the name of this ethic. Whatever - it makes for some exciting video. At one point this dude places no less than 7 micro wires behind a loose flake and proceeds to take repeated huge whippers onto it, tearing gear out each time. The falls are a definite highlight. Unlike some videos where all we see are super hard leads being polished off with ease by the elite, Hard Grit shows us the danger, the scary death defying falls – and then they cruise it. On first viewing we sat there saying things like "put some gear in! ", "oh he's screwed if he comes off here", "no way would I do that!". And down they come, pulling hard moves and falling not always gracefully. It’s edge of seat stuff, at least for an audience climber’s who understand the risks being taken. After the initial scene the movie opens with an historical recreation of British climbing and it's origins. This section is quite funny the first time you see it, though you'll likely fast forward next time. (If you can understand the narrator's accent though, you'll be one up on me). Shot in a deliberately scratchy black and white, with the climbers dressed up to look like old timers from a by gone era, ropes tied around their waists, pipe in mouth, they scale a few classics and go home for tea and crumpets. However, the real meat of the documentary follows. Like I said, hard single pitch trad leads. And a bit of bouldering thrown in. Routes led include Gaia E8, Parthian Shot E9, New Statesman E8, Meshuga E9, Renegade Master E8, End Of The Affair E8, Marbellous E8, Master's Edge E7, Braille Trail E7, Fat Slipper E7, Fast Forward E7, Paralogism E7 as well as various boulder problems including Brad Pit and The Joker. All up a very worthwhile video to own. Makes you want to rush out a climb something hard, to push the boundaries like they do, but at the same time, it makes you cringe from the thought of a nasty fall. A contradictory emotion. Anyway go watch it and you'll know what I'm rambling on about. If only for the opening scene this is a must have. A movie which captured an era. 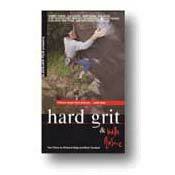 What do you mean, you haven't seen Hard Grit? If the answer to either of those is 'yes' then buy it. This is the undisputed heavyweight champion of the climbing video world. They simply do not come any better than this. Possibly the finest climbing film ever made. Now re released on dvd with lots of extras and well worth it. Up there with the original Masters of Stone, an all time classic. If the scene of Seb Grieve clawing his way up the impossible blunt arete of Meshuga using denim friction knee locks doesn't get you sweating then give up climbing and take up tiddly winks instead. Planet Fear - Reviews, details, etc.